Percy Pilmore was born in Beeston on 10th October 1897, he was the eldest son of Arthur & Maria Elizabeth (née Thorley) Pilmore who in 1901 were living at 17 Dagmar Grove, Beeston2. When Percy was baptised, on 12th January 1898, the family was living in Beeston Rylands. In 1901, his father aged 25 who hailed from Teigh, Rutland, was working as a Joiner; his mother, aged 26 and born in Beeston, was looking after Percy and Ernest, his brother, then aged 6 months, at home. Later, a sister, Nora Kathleen was born in 1907, followed by Linda May in 1900. Nora eventually worked in the offices at Beeston Boiler Company. Percy started at Nether Street School on 1st August 1909 at the age of 12 in the autumn batch which came from the infants of Church Street School and left to find employment - employer currently unknown - on the 10th of February 1911. Percy Pilmore enlisted at Nottingham and joined the 2nd Battalion Sherwood Foresters. "Corporal Pilmore was a keen member of the Beeston Lads Club and it fell to the lot of an old friend Percy Giles to break the sad news to his parents that their only surviving son had been shot in the head on the morning of 12th March 1916 and had died the same night. He was buried in Poperinghe New Military Cemetery." The following "In Memoriam" was in the local paper, from his family, who had the misfortune to also lose Ernest, their youngest son, through illness resulting in his death in 1913. They were then living at 47 Denison Street, Beeston. 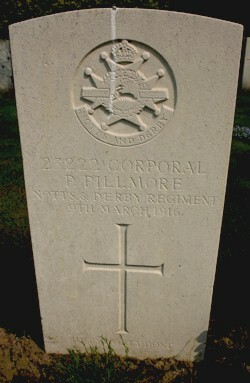 1The surname is recorded as "Pillmore", here and on the Commonwealth War Graves Commission website. (http://www.cwgc.org). The family appears to have used both variations of the name at various times.